After an illustrious yet injury-hindered three decades in boxing, former Olympian Bradley Saunders has officially announced his retirement from the sport. The former long-standing Team GB boxer bows out of with an abundance of amateur honours and a professional title sitting proudly in his packed trophy cabinet. The 32-year-old from Sedgefield endured a long period plagued by hand and eye injuries that saw him undergo corrective surgery on multiple occasions, but ultimately resulting in his difficult decision to step away. “I’ve had five eye operations now and I’m going back into hospital for the final one,” the Beijing 2008 Olympian, recently based in Spain at MTK Marbella, explained. “People think I’m retiring because of my hands, but it was my eyes, they are only just settling down now and looking normal again. “My last operation in Spain didn’t go right and I’ve been advised to sue them for the complications, like the double vision I’ve had, been seeing two of everything! Doctors said I shouldn’t even be allowed to drive a car, let alone get in the ring and fight for a living. Saunders blasted away EU super-lightweight champion Ville Piispanen (18-5-3) in just 81 seconds that night at the Metro Arena in Newcastle to collect the vacant belt, in what would be his last fight signed to Hall of Fame promoter Frank Warren. The heavy-handed Saunders raced to 12 fights unbeaten with nine knockouts in the first three years of his career, during 2012-2015, despite being hampered by recurring injuries. Specialist hand surgeon Mike Hayton was called upon to operate on the injured fighter’s fists on three occasions. One of these surgeries prompted a six-month layoff before Saunders’ returned to the ring against underrated Frenchman Renold Garrido (15-11-1) in his third appearance under the Matchroom banner. Unfortunately for Saunders, his 13th professional contest saw him fall to his first professional defeat and first loss overall in seven years. It was in September 2015 at the Liverpool Olympia that Garrido managed to derail the County Durham star’s career by swarming his debilitated opponent until he was disqualified in the sixth round for an intentional headbutt. Saunders had ruptured ligaments and damaged previous bone grafts in both hands and went back under the knife in a third attempt to fix the periodic problems. Saunders originally debuted at the York Hall in London in February 2012 after a stellar amateur career and was last seen in the ring in June 2017 making short work of Northern Irishman Casey Blair, stopping him in the first round in Newcastle. Peter Sims was the man responsible for whipping Bradley into shape for what turned out to be his last professional contest. He added, “As a pro, I don’t think he got a fair crack of the whip and too much was expected too early. It might have been different if he had kept active after the last win, but the eye op postponed all that. Initially inspired by his dad, Jeff, an amateur boxer with his own gym, Bradley started boxing aged eight at Sedgefield ABC, having his first fight at 10. 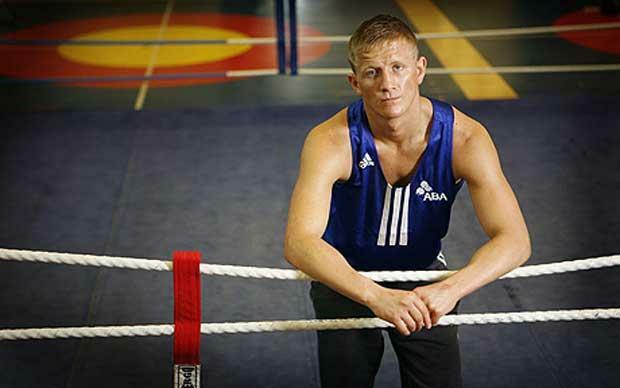 As an amateur, Saunders achieved incredible heights and was a member of the Team GB squad for over 10 years. Saunders won the senior ABA title in 2006 (adding to four schoolboys and a Junior national title), a World bronze medal in 2007 and a Commonwealth silver in 2010. He was part of the Beijing 2008 Olympic squad with heavyweight hero David Price, two-weight world champion Amir Khan and WBO middleweight king Billy Joe Saunders. During his Team GB days, he fought all over the world against the very best in the amateur code, beating three Olympic champions in Manus Boonjumnong, Aleksei Tishchenko and Matchroom’s latest signing Daniyar Yeleussinov. Facing a future without boxing, Saunders has since set up a business to provide for his wife Stephanie and 11-year-old son Leyton. On hanging up his gloves, Saunders gave thanks to all that helped him during his career and lifted the lid on making the difficult decision. “I have been having a hard time coming to terms with knowing that I will have to retire, going out all the time and drinking a lot, but I am a lot better within myself now. “I’d like to thank everyone I’ve been involved with during my entire boxing career from coaches to promoters to the fans, it’s been such a big part of my life. “I’m still going to be involved in the sport, I was only sparring my brother Jeff [a 12-0 super-lightweight] the other day. I’m going to concentrate on his career and help as much as I can. I think he can go all the way. Bradley Saunders hangs up his gloves with a professional record of 13 wins, a single loss and one professional title, but will mostly be remembered for an astounding amateur career likely to be unrivalled for many years to come.